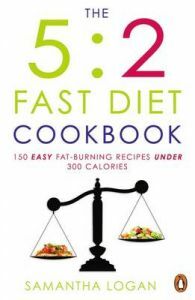 Lose weight and never feel hungry with The 5:2 Fast Diet Cookbook! The 5:2 diet has become the food programme of choice for losing weight. Everybody swears by it - because it works! This cookbook holds the key to learning what to eat on these low-calorie fasting days. Inside, you'll find recipes and tips for getting the most satisfaction and fullness. With 150 nutritious recipes, none of which has more than 300 calories per serving, you'll have a wide variety of choices for these two crucial days. With delicious dishes such as Cinnamon-Swirl Pancakes for breakfast, Fast-astic French Onion Soup for lunch and Slow-Cooking Provence Chicken for dinner, which are all easy to make and packed with flavour, you won't even realise you're dieting. The 5:2 Fast Diet Cookbook even has a special "dessert" section in the back that will give you low-calorie rewards to look forward to on non-fasting days! Samantha Logan experimented with fast dieting when she couldn't lose her stubborn baby weight even several years after her second child was born. The fasting recipes she developed in this collection helped her to lose an amazing 30 pounds.